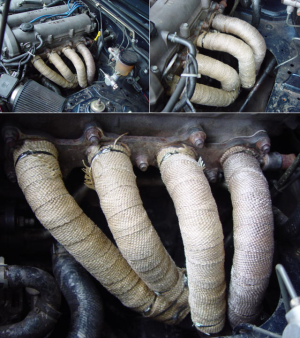 If you are wondering why I would spend close to $80 and about two hours wrapping my exhaust headers in what looks like coarse burlap, read on, and I will tell you all about it! When I bought the car back in 2006, its stock exhaust manifold (made of cast iron) was cracked and the seller graciously helped me install a new one, made of stainless steel. It looks spiffer than the stocker part, is much lighter, and supposedly enhances the exhaust flow, thus improving engine performance. It also gets very hot. Very very hot. And my car has no heat shield. This provides for a very toasty climate underhood and effectively turns my famed cold air intake into hot air intake. In summer, this contributes to engine pinging (so the theory goes). So what's a girl to do? I have been thinking about it for a while, but with all the other improvements on the car this year, something as prosaic as exhaust wrap did not make it far up the priority list. At very long last I bought some DEI fiberglass composite wrap, plus some steel ties and silicone sealant and wrapped as much of the header as I could reach without taking the exhaust off the car. Fiberglass particles went flying everywhere, so I was wearing goggles, gloves, and a breath mask. It took me about 1.5 hours to finish wrapping, now the car needed to be taken on the road to get the wrap dry before it could be coated with the silicone spray. I needed to run some errands, and by the time I got home it was too dark to spray anything, so I guess I will have to finish the job later this week, after work.